Almost eight years ago exactly, I took my boyfriend, Dave, with me to attend my sister's boyfriend's missionary farewell. Brandon and I had developed a good relationship, and I suspected he would eventually become my brother-in-law. Though Dave and I had only been dating a couple of months, I hoped that he would also become Brandon's brother-in-law, and I thought that the two should meet. Anyone who knows Brandon's family knows that to go to their house is to be treated to an impromptu concert. And if you play an instrument, you should be prepared to be a featured artist on the program. As is customary after mission farewells, Brandon's family hosted a large gathering at their home, and according to Hunt family tradition, all of the instruments came out. We played everything from classical to Broadway, from folk to jazz. Sitting in the corner, barely noticeable, was another artist. He wasn't playing or singing, but sitting quietly with sketch pad in hand. I didn't even know he had chosen me as a subject until eight years later (just few days ago now), when a series of his artwork appeared on facebook. Of the sketch, artist Daryl Hunt wrote, "This drawing was done very quickly with a ball-point pen. I wanted to capture the gesture and something of the energy of the musician as she played her violin." I cannot think of a greater compliment I have ever received than that of the drawing he made. Besides being incredibly flattered, this depiction of me brings back the happy memories of that day--introducing my future husband to my future brother-in-law, and the joy of making music with friends and family just for the fun of it. Beautiful thoughts. Our lives are blessed by both artists. *happy sigh* That's beautiful - both the picture and the description of the event!!! SOOO cool. I want one. Love this. Beautiful subject beautifully rendered. I am a professional violinist who enjoys concertizing as a soloist, and collaborating with other artists, including the Boise Philharmonic, pianist Robyn Wells, Trebelle piano trio, and Daniel Bishop the Storyteller. I also perform in church with my husband, Dave. In the future, I hope to be able to play chamber music with my three children! 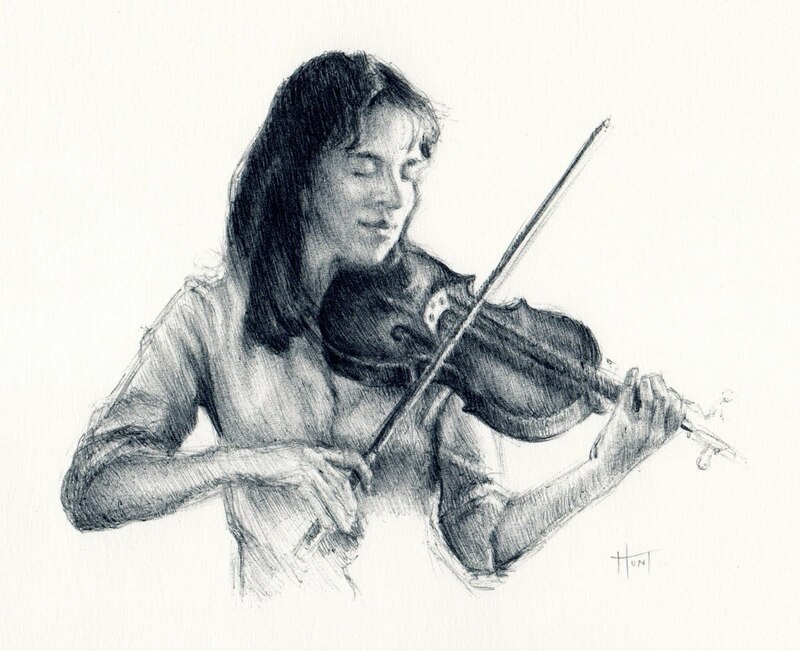 Please browse through the pages below to learn more about me; or for information on upcoming events and recitals, LDS hymn arrangements for violin and piano, and to hear audio samples. Feel free to contact me to make comments or requests. You must once and for all give up being worried about successes and failures. Don't let that concern you. It's your duty to go on working steadily day by day, quite quietly, to be prepared for mistakes, which are inevitable, for failures.